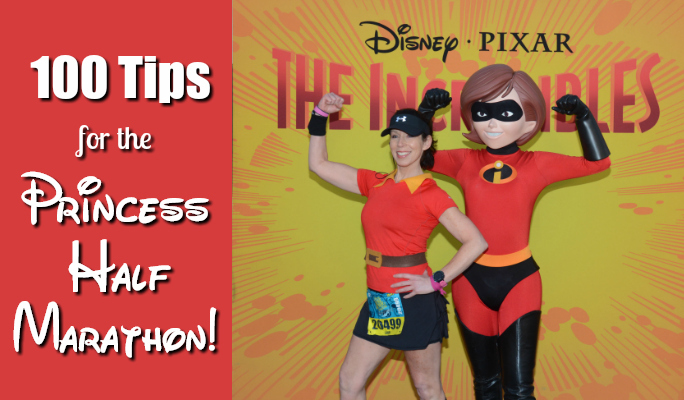 100 Tips for runDisney’s Princess Half Marathon! 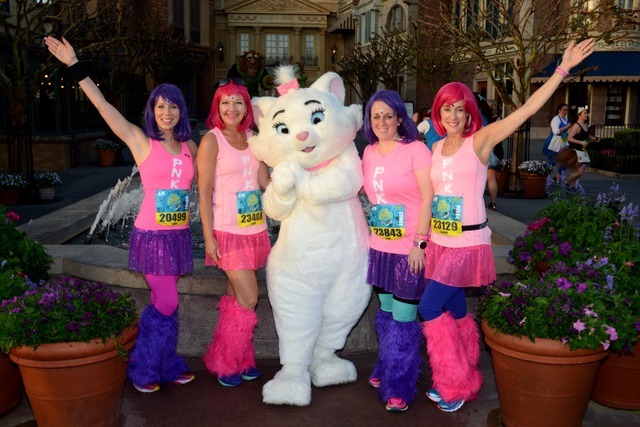 Ah, runDisney’s Princess Half Marathon, the shiniest race of the year with tutus and tiaras and sparkle, oh my! I ran my very first runDisney race at the 2013 Princess Half, so this weekend holds a special place in my heart. 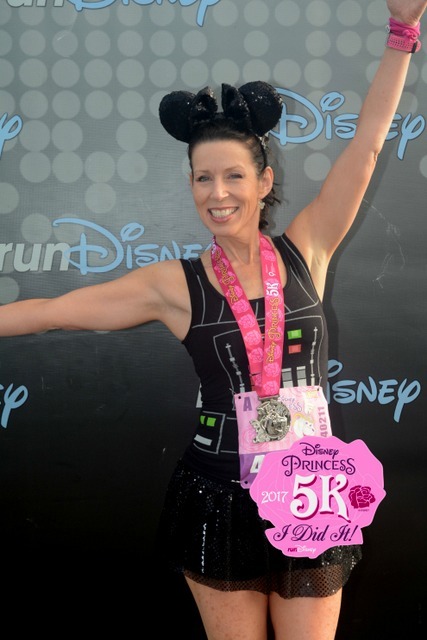 It’s often the first half marathon for many runners, so today, I’m sharing a list of 100 Tips for runDisney’s Princess Half Marathon! Yep. I said 100. That’s a lotta tips, so put on your tiara, grab some coffee, and get ready for a long read! 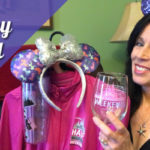 Be sure to also check out my recent LIVE show where I chat about all things Princess, or head over to our runDisney tips page for more detailed topics. I’ve also done a ton of video recaps for extra training motivation! Until then, let’s jump into the fun! ETA: This post will be updated once the 2019 Official Digital Event Guide is released. Some changes have already been made. Once on Magic Express, however, I saw a group of dynamic, vibrant gals my age decked out in pink sashes and tiaras. So. I pulled out my tiara, put it on my head and felt pretty amazing. 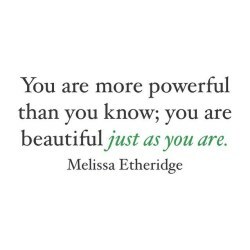 So buy that bling and be ready to tiara up! Hydrate, hydrate, hydrate! At least one week prior, make doubly sure you’re properly hydrated by drinking enough fluids so your urine is the color of light straw. Also, try to avoid alcohol to cut down on bloating. Not that I always follow this advice. (Like, ever.) But still. It’s good advice. Pack wisely! The weather in Florida can be quite persnickety, so be prepared for all types of weather. Cold, hot, rainy, and every temperature in between. I’ve learned my lesson the hard way during the 2015 WDW Marathon Weekend when an unexpected cold front came in! So regardless of the forecast, I always pack an emergency cold weather outfit. If you’re sharing a room with friends, staying organized is key! My favorites tricks are using a hanging shoe and sweater rack that can be shared, a tote organizer and my handy Vera Bradly hanging bag (affiliate link) for toiletries. For more tips on how to organize your resort or hotel room, be sure to check out this blog post and video. Pack EARLY! 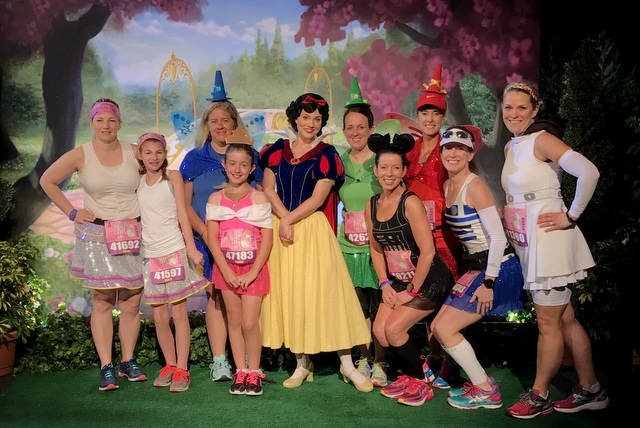 If you’re doing both the 5k and Fairy Tale Challenge, you’ll have three early mornings, plus a fourth if you plan on arriving early on Thursday for the expo. So don’t start your trip sleep deprived by having to stay up late packing the night before. Pack a few days early so you can relax instead and give yourself a pedicure! And while I’m at it, don’t wait until the last minute to finish up your costumes! I’ve done this more times than I can count and this poor planning has given me a ton of anxiety. Plan early, make early, and then have that glorious peace of mind! And speaking of pedicures … this is an oddball tip, but if you have a callous from running, take it easy with the buffing. I made the mistake of going to town on one and ended up getting a pretty bad blister! So smooth down the roughest areas, slap some moisturizer on it, and call it a day. Oh, and by the way, make sure you clip your toenails. Of course, you might be thinking this tip is quite unnecessary. But guess who forgot to clip theirs before the Avengers Half and ended up with a bloody toe? That would be me. If you use a Retin-A, retinol, or other anti-aging product on your face and body, consider discontinuing it about a week prior to departure day since it can make your skin more sensitive to sunlight. Which also reminds me. Bring lots of sunscreen with you! And at least two pairs of sunglasses. There is a part on the course after you leave Magic Kingdom where the sun is going to hit you full force! I take this one step further by also taking a screenshot of race schedules, bus transportation hours, and expo maps that I store in an album on my iPhone for quick and easy references. Print your waiver, sign, and then bring this to the expo as well as your ID. They will have computers there in case you forget, but there sometimes can be a line. I always pack a manilla folder that’s cut in half to store my race bib in so it doesn’t wrinkle. (Why I worry about a wrinkled bib, I don’t know.) And usually, I carry everybody else’s bibs in the folder as well, which makes me very nervous about losing it! I also pack a tote or foldable bag to bring to the expo with me since carrying around those plastic drawstring gEar bags can be awkward, especially if you get carried away in the runDisney merchandise area! What to buy, do, and pick up at the expo. What to pack in my gEar bag. This way, if the expo is crowded and chaotic, I won’t get flustered and forget anything. And if I’m running late the night prior to a race or feeling nervous, a pre-written list helps to calm my nerves! 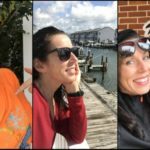 If you are going solo and feeling nervous about not knowing anybody, join a Facebook group if you haven’t done so already! 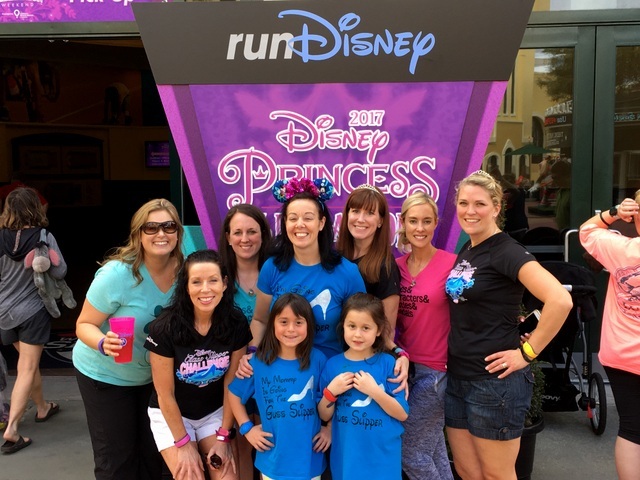 This is a great way to get to know other Princess runners, share concerns, learn tips, and talk about training. 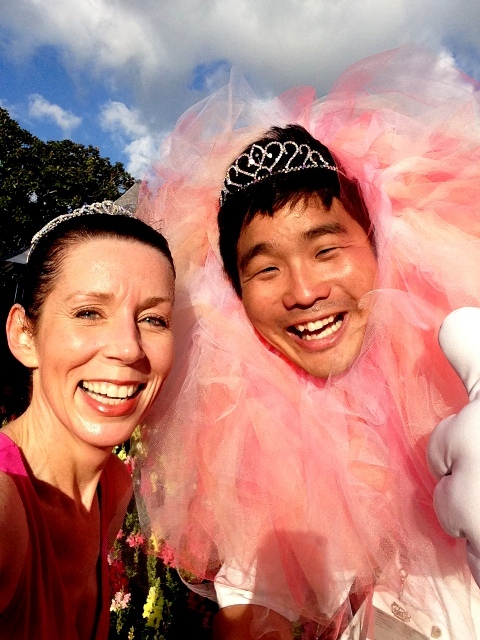 You can find several by doing a quick ‘princess half marathon’ search. 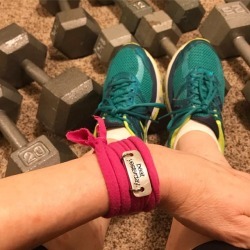 Or head on over to the Joyful Miles Running Club! It’s a no-promo zone with a bunch of amazing folks that I just adore. 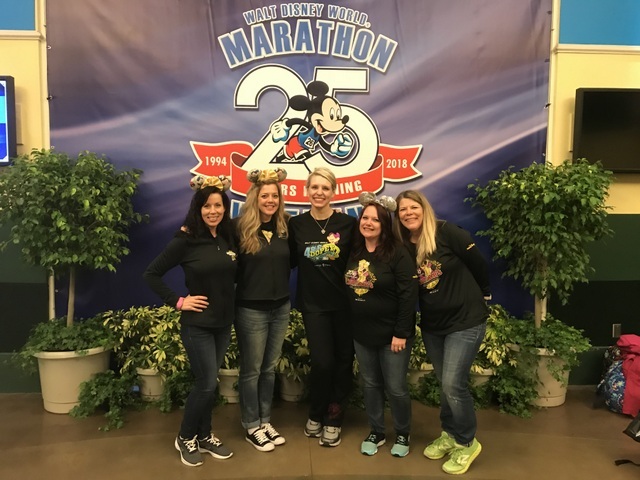 If this is your first runDisney race and you’d like to get a lay of the land, then read blog race recaps! What’s fantastic about these is that each is told from a different perspective from folks with different running styles and preferences. A quick google search can bring up tons! I also have quite the collection for over 40 runDisney races, including five years worth of the Princess Half Marathon! 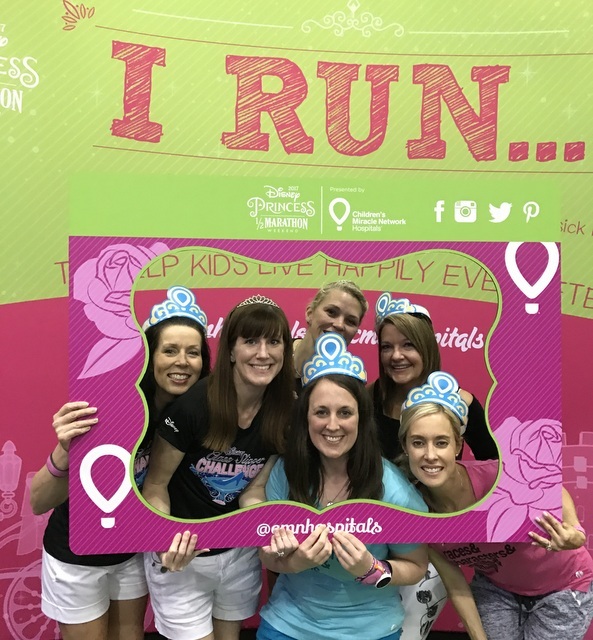 Head on over to our runDisney blog recaps page. Another great way to become familiar with the course and inspire you to keep training is to watch video recaps! Sometimes if I’m bored on the treadmill, I’ll watch video recaps that always gets me even more excited and my pace faster! 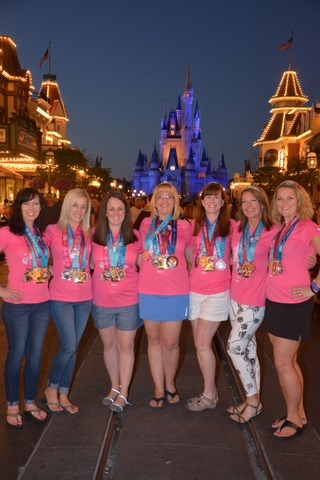 Click here to see my past Princess Half recaps and here to see other runDisney race weekends. 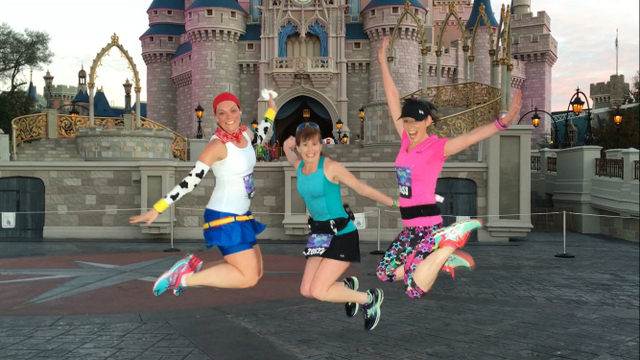 To really make your Princess Half Marathon experience even more magical, wear a running costume! 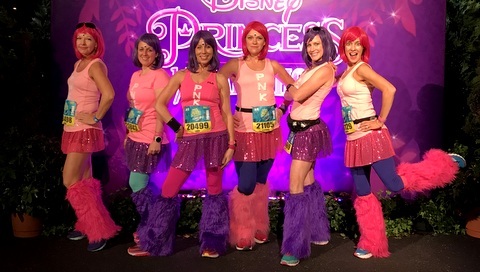 And if you’re new to runDisney and worried about standing out or looking odd … don’t. Seriously. Don’t. You will be surrounded by fantastic costumes! Just be certain to test your costume for comfort and plan alternative options for cold or rainy weather. And it’s not too late to pull together a quick costume! 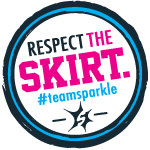 At the expo, buy a Sparkle Athletic or Sparkle Skirt and a Raw Threads tank and there you go, instant outfit. How to make Minnie Mouse Ears for your next runDisney Event! Group costumes are especially fun! Seeing as how I’ve worn quite a few costumes over the years, I’ve started a costume tuturial series that you can find here. 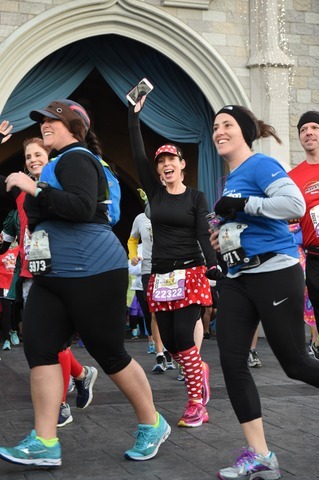 If there is someone who would like to track you during the races, then go to the runDisney website, choose Events and then Princess Half Marathon and under Spectators, there will be a link for runner tracking. What can be a hot topic is tracking the balloon ladies with some folks believing this violates their privacy. I do respect those opinions and had the balloon ladies made a public announcement asking not to be tracked, I would certainly comply. But I also think that had they not wanted to be tracked, then they wouldn’t have taken on the role. Like me, some viewers track me from home and had I not wanted that to happen, then I wouldn’t have set myself up as a public figure of some sort. Still, I’m not going to share the names here since there is no confirmation which balloon ladies will be at each race. 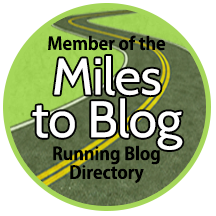 But do head on over to the Joyful Miles Running Club and feel free to ask there. Update your running playlist to keep you pumped and motivated! Or better yet, while you’re running through the parks, put those tunes on pause and embrace the moment by listening to the park music, your fellow runner’s chatter, and the sound of footfalls on concrete! Don’t forget about the virtual goody bag on runDisney’s website! They have many offers and discounts that you can use throughout your vacation or at the expo. For those of you who are running with a friend or in a group, now is a good time to discuss your goals and make a game plan to make sure you’re on the same page. How soon do you want to be in your corral? How many character stops do you want to make? What about pace? If you’re not on the same page, consider meeting early to get character pages and hanging out together in the corral and then meeting up afterward. Look, these races are expensive so it’s perfectly fine to run them the way you want. For those who have family or friends with you, arrange a meeting place at the family gathering area beforehand. A good spot is outside of the gEar bag check tent that has separate chutes according to the first letter of your last name. 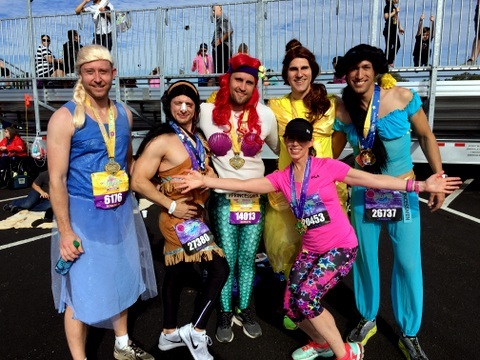 If your family or friends are spectating, here’s a Cheering at runDisney post by our friend, Stephen. He wrote it specifically for WDW Marathon Weekend, but many of it still applies. Another oddball tip, but if you’ve done a Princess Half or other runDisney weekend before, wear a past race shirt to the airport if you’re flying! 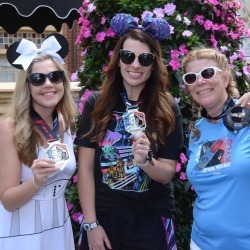 This is a great way to meet other runDisney lovers and strike up a conversation. Before moving on to my Expo tips … congratulations to those who have kept up with your training! For those who have not due to injury or life getting in the way, I’m not going to bust your chops since that’s not my style. But please don’t allow regret and guilt to rob you of this amazing experience. Just do your best, take it easy, and listen to your body. Then next time, come back stronger and wiser! Those who have purchased VIP Race Retreat, your bus transportation from the resorts begin at 9:30am and the early entry Expo time is from 10:00 to 11:00am for the 2018 race. (The bus stop for the expo and all races will most likely be at the front of your resort where Magic Express bus make their stops.) Be sure to bring your I.D. If you arrive after 11:00pm, well, you’re stuck with the rest of us in the general expo lines. For general expo entry, bus transportation for 2018 runs from 11:30 to 7:30pm. (I will update once the 2019 Official Event Guide is released.) Now, the big question always is: When should I go? Well, that depends on how badly you want runDisney Merchandise, a Dooney & Bourke, Pandora charm, etc. If you have your heart set on them, then you’ll want to arrive EARLY on Thursday morning. I’m talking no later than 11:00am, and even sooner if possible because lines will form very early. Just know that you will be competing with personal shoppers and eBay buyers, so be sure to bring your patience. Commemorative Items and Dooney & Bourke Bags are still available for sale! There are no guarantees how long pre-purchase will be available, so if you’re interested in buying pins, magnets, a commemorative jacket, etc., before the expo, now is the time! PROS: You will be guaranteed these items and not have to worry about them selling out. For example, all pins for the Wine & Dine Half Marathon 2018 were sold out by late Thursday. So you need to weigh the pros and cons here to make the best decision! 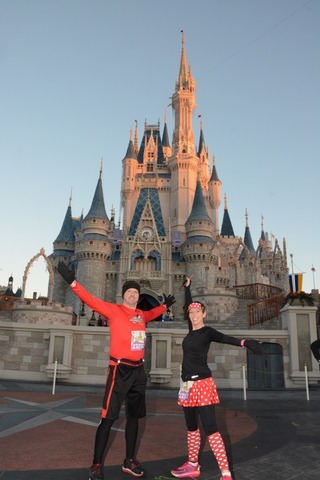 Go to rundisney.com and click on PHM under Events. Click on the Events and then Race Retreat. This will take you to the registration where you’ll have to log in using your Disney email and password. Click on Buy Products from the top menu. Also, one thing we always do is share an Uber to get to the Expo! This way, you’ll be dropped off right at the globe rather than where the buses line up. If you’re not in a rush, then be sure to get a picture of yourself by the globe and the race banners, if they are out this year. We’ve often forgotten afterward or the lines were too big. If you are in a rush, then head straight to the Disney Merchandise area first and leave picking up your bibs and commemorative items last on your list, since nobody else can take them. The aisles will be separated according to each race and Fairy Tale Challenge and will also most likely have a row for non-race specific runDisney merchandise. For the location of the Dooney & Bourke bags, check the Official Race Guide map. If you’re a Disney World Annual Passholder or DVC Owner, make sure to bring your discount card to the Expo for a 20% discount. If you have a Disney Visa, you can get a 10% discount for purchases over $50.00, but note that you can’t stack discounts. For those who have pre-purchased commemorative items, there will be a separate section in the Arena. (The line will be separate from Disney merchandise.) Make sure you bring your ID. Unfortunately, you can no longer return commemorative items which really is a bugger since nobody knows what the merchandise will look like while ordering. Aso, if you regret not purchasing the commemorative jacket, then be sure to hustle to the merchandise tent early before the half marathon on Sunday in case they have some available. Speaking of returns, you can return any official runDisney merchandise at your resort or in the parks. However, if it’s a hot ticket item that sold out quickly, consider leaving a message on a Facebook group to see if someone would like to purchase it. 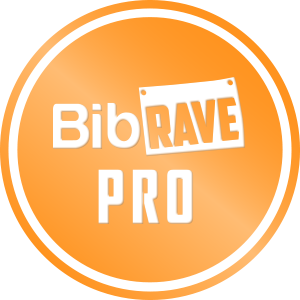 As for picking up your bib packet, make sure you have your ID and signed waivers for each race or challenge you’re doing. Lines will be separated by bib numbers. If you are doing the Fairy Tale Challenge, you must get a picture with your bib to later prove you ran the races. There will be several photographers reminding runners of this. If you want a different size or if there is a discrepancy, take them to the shirt exchange but note that for challenge bundles, they cannot exchange just one of the three shirts. You will have to take a new bundle. Which means they will also need to be checked. Before leaving the Arena, see if there are any character photo opportunities on the top-level! Mickey Mouse was out for the WDW Marathon Expo and Chef Mickey was there for the 2018 Wine & Dine Half, plus they had some awesome banners with photographers for a great picture. Once all your tasks are complete, be sure to head on over to the Visa Center building where there will be many vendors! At the last Princess Expo, they also had booths where you could get a manicure, fun pictures with hats, boas and tiaras, plus they sold chocolates and pink champagne. Yum! 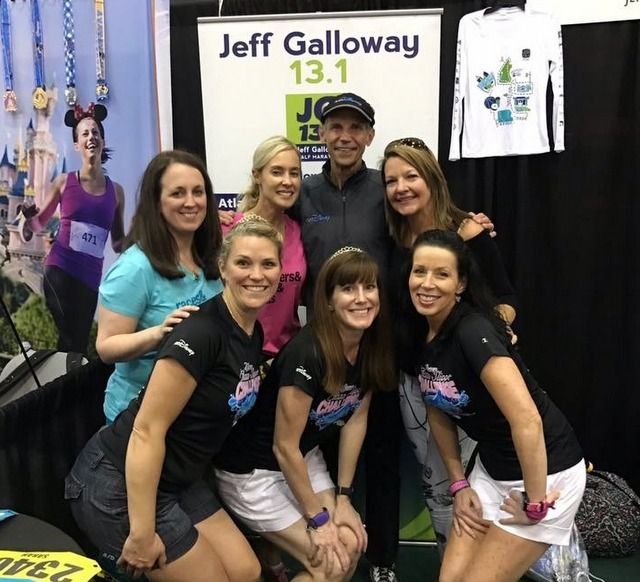 I also love stopping by the runDisney booth to gawk at the medals and get a picture with Jeff Galloway, who will also be happy to sign your bib for good luck! Quick note that your Magic Band will work at the Disney merchandise registers, beer stands, and the grill, as long as you have a credit card linked to it. Oh, and beer mugs make great souvenirs. Plus you can bring them to the races for a discounted refill! When it comes to your post-race meal, remember the “Nothing new” rule! Hopefully, you’ve already made Advanced Dining Reservations if a sit-down meal is desired, but if not, check the menus on the My Disney Experience App and see what kind of ADR’s are available. Often resorts and Disney park restaurants will accommodate post race meals for runners. For example, at the Contempo Cafe at the Contemporary, they will replace the need for grilled chicken on flatbread. If you’re a coffee drinker who will be in need of caffeine, sometimes the food courts will have coffee available very early. I know All Stars often does and for Marathon Weekend, Animal Kingdom Lodge had coffee available for runners. Be sure to check with guest services beforehand. They might have coffee stands or a food truck on the morning of the Half Marathon, but there’s no guarantees. For myself, if I’m not staying in a room with a coffee maker, I buy a coke the day before to keep in the fridge. Bib with safety pins already attached. Race nutrition such as gels, sports beans, etc. Tissues, since my nose always runs. I often will place my Body Glide and Vaseline near this pile so I won’t forget to use it the next morning! I almost got a nasty blister last year from forgetting to put Vaseline on my toes before the Half Marathon. A phone charger and cord for pre/post race charging. If it’s chilly, I’ll bring yoga pants, a jacket, spare emergency blanket, gloves, and knit hat because I’m a big head sweater who gets bad chills. If it’s going to be hot, I’ll throw in hand wipes and sun block for a quick second pre-race dose. Souvenir beer cup from the expo for a discounted refill after the 10k and half Marathon. For the 5k and 10k, I will bring sunglasses in case we’re going to a park afterwards but they most likely won’t be needed for the races. I also toss a drawstring backpack for after the race since it’s much easier carrying items in this rather than the plastic gEar bags! Race mornings can be chilly, so if the temps are going to start off low, bring a mylar blanket or jacket to wear before gEar bag check. Or wear throwaway clothes to keep you warm in the corrals and then toss. runDisney does gather these for charity. A popular question is always, “Will I need to bring my own water?” I never carry water since there is more than enough water/Powerade stations to get me through and I’m the type of runner who needs to drink a ton. However, if you’re used to wearing a hydration vest and it’s a source of comfort to you or if you don’t like the taste of Powerade, then consider bringing it with you. Take note that they will not have Powerade at the 10k, so if it’s especially hot, you might want to pack electrolytes such as Nuun tabs. Also, the Powerade they serve during the Half Marathon is made from a mix and isn’t always the best tasting stuff. I can get by during halves but for the full marathon, I need a Gatorade! Regarding race nutrition, make sure you have what you’ll need to get through each race. For the half marathon, runDisney will give out sample-size Sports Beans but I don’t like trusting runDisney for my nutrition since they have run out in the past. Same for post-race recovery. runDisney will give out a bottle of water, Powerade, food boxes and a banana afterwards but the boxes rarely have a good source of protein so I always bring my own. The night before, you’ll want to make sure to charge your phone, Garmin, wireless headphone, and all other gadgets. 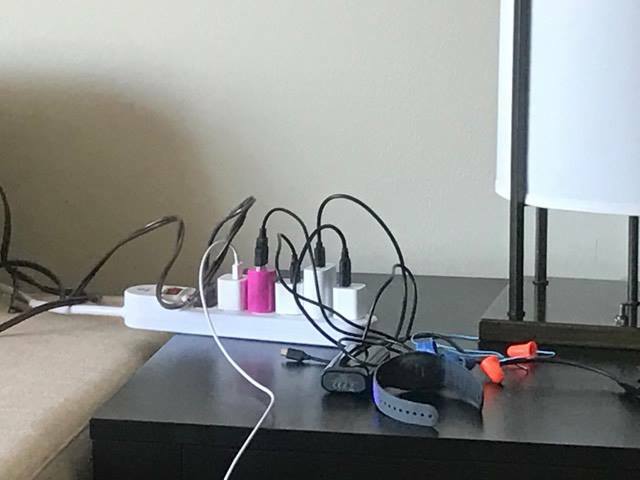 Bringing a power strip will make this much easier, especially if there are other runners in your room! My group of gals were very amused by mine last year. Set your alarm. No, set TWO! As for what time to wake, that depends on when you want to be on the bus or drive to the race start. Pick this time and then backtrack how long it will take you to get ready. Turn off your phones notifications. This is especially important if you’re in active message groups like I am! If sounds outside of your room are a concern, then try a white noise app and definitely bring ear plugs! This is going to sound gross, but Jackey, Leslie, and I also have a no-flush rule in case one of us has to get up in the middle of the night to go to the bathroom. Unless, of course, it’s a certain color and needs to be flushed. Perhaps I should move on. But seriously, it’s a good rule since those toilets can be LOUD. Once that alarm sounds … I don’t care who you are, you’ll most likely have that moment of OH MY GOSH, WHY AM I DOING THIS?? The answer is because it’s AWESOME, and you’re going to feel so amazing once you’re there! 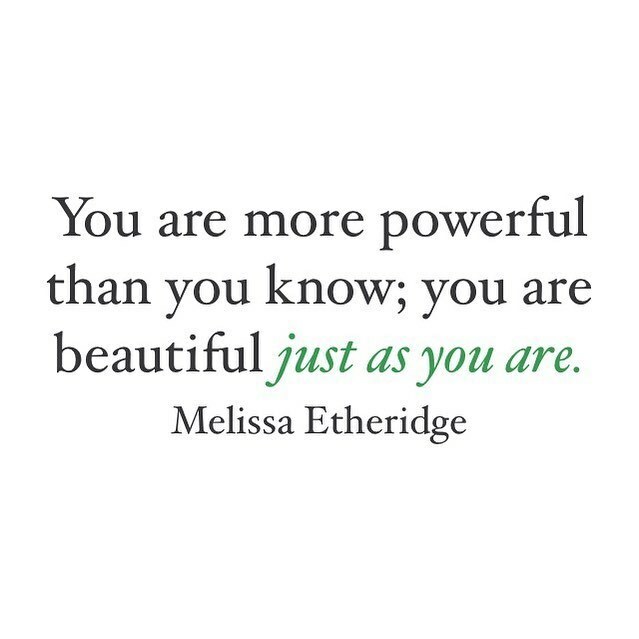 So get up! While you’re clamoring around getting ready, make sure you take the time to eat. Maybe you can get by with very little during a training run at home, but on race day, there will be hours before race start. For example, if you wake at 2:30 for a 5:30 race, that’s a three-hour spread. I like to eat a bagel with peanut butter and also bring a granola bar to eat an hour before the race as well as Sports Beans thirty minutes prior. At 2:30 in the morning when it’s pitch-dark outside, the last thing you’re thinking of is sunscreen. But I always put on a nice solid base in case I get too excited to remember a second dose later on. And like I mentioned before, I always put a small tube of sunscreen in my gEar bag as well as a Handi-Wipe so I can clean my hands off after applying. What I do is use a foundation primer first, (my favorite is Rimmel’s Fix & Perfect, affiliate link,) then set my foundation with translucent power. Jackey is a big fan of Urban Decay’s Makeup Setting Spray (affiliate.) Waterproof eyeliner and mascara is always a must! And I always carry a bright-colored lipstick with me that really makes your pictures pop. Oh, and as for carrying that lipstick, I’m loving these wrist wallets (affiliate link) for holding my license, credit card, and lipstick. This way, there’s no digging in my pockets or race belt! For this year’s bus transportation and race start times, be sure to check the Official Event Guide. If you’re driving, then try to leave your hotel or resort 15 minutes prior to the bus transportation start so you will have less chance of hitting any traffic. Plus, you will have LITTLE to NO LINES for character photos until the first wave of bus riders arrive! If you leave later, you do run the risk of hitting traffic. As for Ubers or other pick-up service, I will be using this option each morning solo since the gals in my room aren’t as ambitious as me when it comes to character photos. I don’t have any experience with this personally, but a friend used it every morning for the Dopey Challenge and it worked out great. My plan is to do a test request about fifteen minutes before I want to be picked up, just to see how long it will take for a car to arrive. Regardless of how you arrive, those who are carrying a gEar bag or wearing a race belt will have to go through the security line. Have your drawstring bag open and also open any smaller bags inside to save time. Head right to the character lines if photos are your top priority. The end of each line will be marked by a volunteer holding up a sign. If a friend gets their first, have them wait in line so you can join them. When we do this, however, we only get a group picture taken as opposed to individual ones since that would be rude to the people behind us. Turning off Bluetooth and WiFi if you don’t need it. Turning down your screen’s brightness. Exit all open websites on Safari. Turn on the Low Power Battery mode. Since I carry my phone throughout the race, I add a wrist strap to the phone case for drop protection. Many gals are big fans of Sparkle Skirts with their huge pockets, but I’m loving the Happy Puppy shorts that are super comfortable and allow me to wear my favorite Sparkle Athletic skirts! The merchandise tent will be open before and after the half marathon. If you plan on buying any additional merchandise, do so before bag check so you can store your purchases in your gEAR bag. Now, let’s talk port-o-pots. For the 5k and 10k, lines for the bathrooms on the other side of the gEar bag tent will be much shorter, since the starting corrals are in the opposite direction. Bathrooms near the merchandise tents sometimes will have shorter lines as well. For the half, it can be hit or miss, so it’s a good idea to wander around before committing to a super long line. They will also have portables along the walk to the corrals and near the corrals as well! Head to your corral early if you want to be near front. This will be even more important now that there will be less corrals with mini-waves within each corral. It will be a very short walk to the 5k and 10k corrals, but a mile-long haul for the half marathon. Oh, and for the half marathon, grab some water before you make the long haul to the corral in case you will need to sip that with any pre-race gels or sports beans later on. They will have this set up between the gEar bag check-in tent and portable toilets. Make sure you go to your correct corral. You can drop back to be with a friend, but they will not let you move forward. Seriously. Don’t even try it! If the weather is chilly and you’re wearing a throwaway or mylar blanket, make sure you don’t keep it for too long. I made that mistake during the 2015 WDW Half Marathon by starting the race wearing throw aways which made me sweat, so after tossing them, the wind hit that sweat, making me colder than ever! So ditch them before race start and allow your body to then warm up naturally. Be careful to not wear your mylar blanket wrapped around your body over the starting line as well, since it can mess up your timing chip. Oh, and a quick word about nutrition! For me, one of my biggest racing mistake is getting so excited and caught up in the moment that I forget to eat my usual pre-race pack of sports beans and take a salt supplement. I also often do a horrible job throughout the race of taking a Gu gel or sports blocks every thirty to forty-five minutes, depending on the temperature and how much I’m sweating. One thing that can help is by wearing a paper racing bracelet and highlighting the miles where you need more nutrition. Or I take a Gu after water stops around the mile 3, 6, and 9 marks. Depending on your goals, don’t worry about your time! A personal record is totally possible if you start near the front of your corral and don’t stop for any character pictures. But for me, I like to soak out every single second that I can and get my PR’s at local races! If you’re worried about being swept, keep in mind that the official time doesn’t start until the last runner crosses the start line, usually the balloon ladies. To help ease your fears, get to the start of your corral early, and skip the first few character stops. Also, if you’re wearing a Garmin or other GPS device, make sure you set it to not pause when you stop for photos or go to the bathroom. This way you’ll have a more accurate account of your pace. 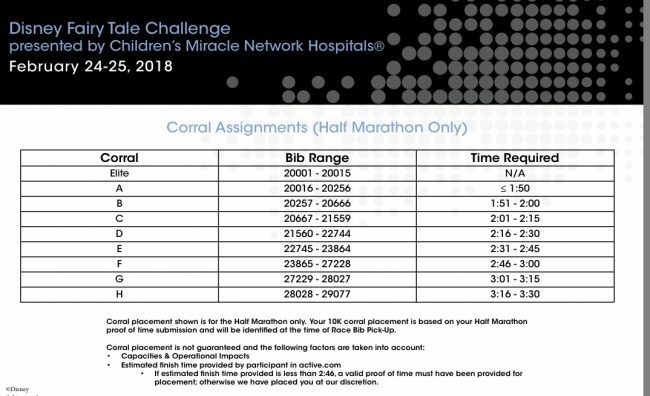 There will be sweep points for the 10k and half marathon, so be certain to stay at a 16mm pace, although those in earlier corrals do have some wiggle room. Just don’t get too carried away! You cannot be swept once you enter Epcot, though, so take a deep breath then! As for character photos, there will most likely be a Photopass photograper as well as one or more cast members who will take a picture with your phone. Make sure your phone is ready with the camera app open before you turn and move quickly to the character to help the line move faster for those behind you. Also, if you are with a group, plan out our pose while you’re waiting in line as opposed to once you’re with the character. For more tips on how to get great character photos, be sure to check out this blog post or video over at our YouTube channel! As for mile marker photos, there’s sometimes a volunteer or Cast Member there to take pictures at signs within the park. If not, ask the runner behind or in front of you if they’d like to switch cameras! Most often they will say yes. If character lines are just way too long, then take advantage of other cool photo ops like in near Spaceship Earth, by the castle, near fun spectators or by awesome race signs! Sometimes the spectactors are just as amazing as characters, like this awesome guy! Let’s talk about etiquette. RunDisney does list out some etiquette rules in the digital guide, so be certain to read through that. However, a common sense, courtesy and patience really goes a long way! For example, yes, it’s best to pass on the left but there will be times when that’s not possible and it makes more sense to pass on the right. So just be sure to look over your shoulder and warn those in front by saying, “on your left” or “on your right” if you will be passing close to them. 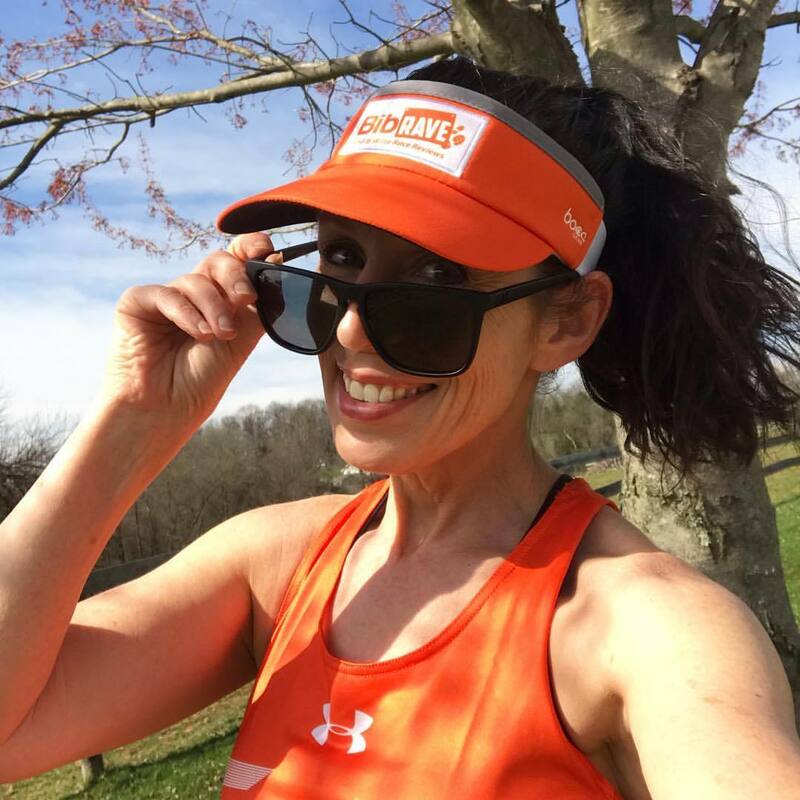 It’s especially important to glance over your shoulder if you are going to hop off the pavement to pass to make sure another runner isn’t coming up behind you. Which brings me to another hot topic. Crowding. Look, it’s going to be a big race with a lot of runners … 26,000 alone for the half marathon and there will be many participants who are new to the sport. So there will be moments of crowding, especially after leaving Magic Kingdom when you hit Cone Alley and at the castle. And there will be times when you’re cut off or even bumped. Regardless of the reason – whether it was accident or on purpose, don’t let this ruin your race or darken your mood. Just smile, have patience, and move on because you can’t control a crowded course. But you can control how you react to it. There will also be moments when you are unable to pass due to crowds, forcing you to slow your pace and reduce your stride. This happened many times to us during Dopey weekend and running with those short strides really hurt my legs. I would have been better off walking at a brisk pace until a passing point opened up since my walk is just as fast! To make things easier on those around you, if you are a walker or run/walker, try to stay right at no more than two abreast and race your hand to let those behind you know you’re about to walk. If possible, try to hold off your interval during very congested area unless doing so will mess up your pace. If you’re a faster runner starting in an earlier corral, know that by stopping often for character photos, you will be placing yourself amongst those who run at a slower pace so you will have to do lots of weaving. In other words, don’t blame the walkers if you placed yourself in their territory. If having to dodge others will annoy you, then consider skipping character photos until later in the race. That way, you will stay with others runners who share your same pace. It’s also fantastic to thank all the volunteers and spectators! Trust me when I say they will truly appreciate it! And if you really want to rev up a crowd of spectators, holler “thank you for being here,” as you run by! Now. Let’s talk about jump shots! To get that awesome coveted jump shot, have the photographer use the burst feature on your phone. In the past, I’ve also had luck with being videotaped and then taking a screenshot although they often turn out fuzzy. Also remember to keep your face relaxed instead of tensing! And be sure to use the hashtag And be sure to use the hashtag #joyfuljumpshot so we can see it and share with others! Okay, let’s talk about the castle! There will be several places to get that awesome castle picture in Magic Kingdom. The first is after you run down Main Street and hook to the right. After the spectators are roped off on the left, you’ll see an alcove area before the bridge entering Tomorrowland. Sometimes a cast member will be there to take pictures but I’ve never seen Photopass there. You’ll also have a chance to take a selfie before running through the castle – just be certain to not cut off anybody. Most times, runners are herded to the right after the run through, so stay to the left if you want a great Photopass picture. The best one to get, however, is after running down the ramp and to the left, where there will be several lines of Photopass photographers. Most times, the line at the very end is the shortest and take note that they do not take pictures with your phone in order to move the line along faster. A great tip, though, is to ask the person behind you to take video as you run up and get your picture! And then finally, there is another opportunity for a side castle photo after you run toward Liberty Square on the right after the bridge. For Marathon Weekend, they did have a Photopass photographer there but there is no guarantees. For the 5k and 10k, you won’t come to a real bathroom until you enter Word Showcase. (For the 5k, that’s roughly at the 1.25 mark and 3.25 for the 10k.) You’ll enter in Mexico and the first real bathroom is on the left in Norway. If the line is too long, see if you can make it to Germany. There’s also one near the teacups on the right. After the castle, there’s also one in Frontierland and chances are, there will also be a character line there. If you’re running in a group or with a friend and there’s a character line near the bathrooms, have them wait in line for you then switch. We’ve done this many times! After leaving Magic Kingdom, the next real bathroom won’t be until Epcot. If you forget any of these locations, don’t worry. There will be tons of cast members around to guide you to the nearest one! Also, we always like to stop in the bathroom in Epcot before finishing, so we have time to freshen up and make sure our costumes are still holding up for the finish line. Speaking of which, that finish line will be in site before you know it! Getting good placement for a great Photopass picture is always desired, but make sure you don’t do so at the expense of another runners such as by jumping in front of them, slowing down at the last minute, or holding up a large flag. Also, be sure to smile and be photo-ready at least ten feet before the finish line and don’t drop that smile, (or stop your Garmin,) until you’re at least ten feet past it since there are many photographers taking pictures at different angles! And besides. Your Garmin mileage is going to be completely out of whack any way. They often have characters at the finish line greeting runners in. Some folks like to stop and to get selfies with them, but I’ve found this breaks my momentum and flow plus it also puts me at risk of ruining someone else’s timed photo finish. So I wait until afterward to get those character photos! Now let me be the first to say CONGRATULATIONS, job well done! There will be many volunteers handing out medals on both sides of the chutes. The first tend to be more crowded so walk down a bit to get yours. If it’s chilly, they might hand out mylar blankets but there’s no guarantee, so if being chilled is a concern, put an extra mylar blanket in your gEar bag. They will hand out water, Powerade, snack boxes, and bananas. To ensure there will be plenty for the runners behind you, take only one of each. If you are a Fairy Tale Challenge finisher, you will be directed through a tent where a volunteer will verify it’s you by checking the photo you had taken at the expo. You’ll then get your awesome medal! There will also be many banners set up with Photopass photographers. Lines can get long, but you might regret it if you don’t stop! Note that they won’t take photos with your camera but there will be more opportunities later. Also, if you are with a group, it’s perfectly fine to get one group photo and then individuals as well. You earned it! You’ll then go through the gEar check tent and if you listened to my advise about packing a small knapsacks, you can then drop all your drinks and snack box inside! Trust me when I say it’s a lot easier than toting everything in those plastic bags. Don’t rush off! 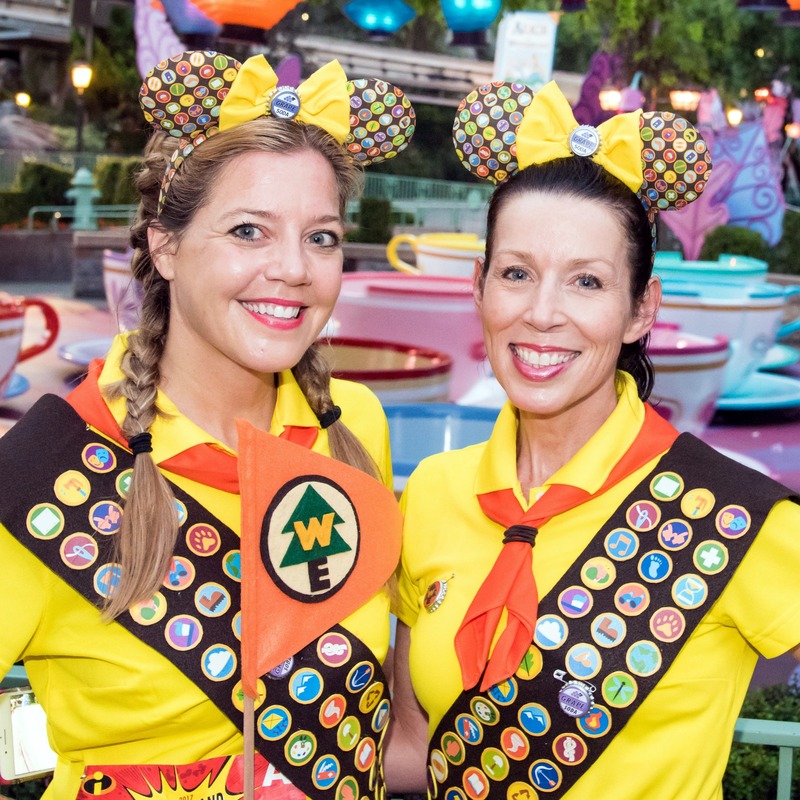 Soak in every moment by sticking around, getting character pictures, dancing to the music, and having an adult beverage … or two! And if you see the #PrincessMen be sure to get a picture with them! Just make sure to use your best pose because otherwise, Pocahontas will completely show you up. With all the excitement, however, make sure that you recover properly by hydrating, eating some form of protein, stretching, and if necessary, rolling, or taking an ice once you’re back at the resort. If there’s a hot tub there, a good soak might do you wonders since you still have lots of park walking to do later! Speaking of park walking, make sure you wear good recovery shoes or flip-flops. Yes, cute sandals or sneakers do look pretty in photos, but your feet might end up hating you. For my list of favorite recovery sandals, be sure to check out this post! Wear your medal everyday of your vacation!! The first time I ran the Princess Half and wore my medal afterwards, I didn’t see a single person with theirs at the resort and on the way to Epcot, making me thing that I was foolish. But then once inside I ran into a group of gals all decked out with theirs, and many others! So wear it with pride because you earned that pretty puppy! And this is an oddball tip but a fantastic one … if the velcro at the back of your neck bothers you, turn the lanyard until the velcro is laying beneath the strap at the bottom! Now that you have those medals on and you’re walking in the parks, be sure to get lots of awesome photos! Some favorites are by the castle and at the princess fountain behind the castle. I love checking out social media and seeing the creative photos people post! And make sure you eat something horribly fattening and sweet You earned it! My plan is to try as many rose gold cupcakes as possible and my group of gals also have some awesome ideas for a new Disney World snacks video. Be sure to subscribe to our channel to see what we come up with as well as all my race recaps! And lastly, I hope you have an amazing, fantastic, magical time at Disney’s Princess Half Marathon! If you happen to see me, please stop and say hello! I’d love to meet you! 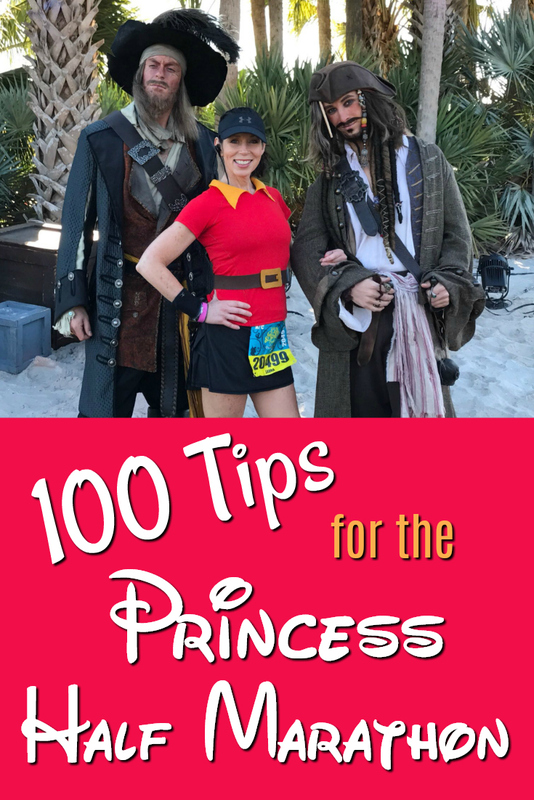 So there you have it, 100 Tips for the Princess Half Marathon! 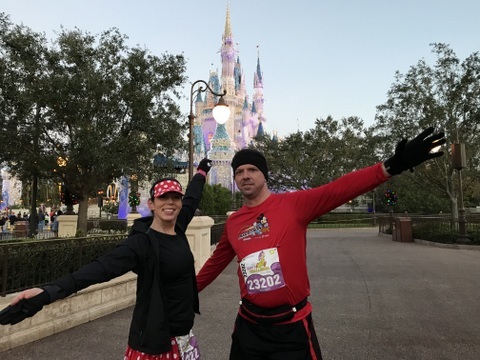 If you’d like more tips on specific subjects, such as packing, room organizing, getting great character photos, and how to make the most of your runDisney experience, then be sure to visit my Everything you need to know about runDisney post! 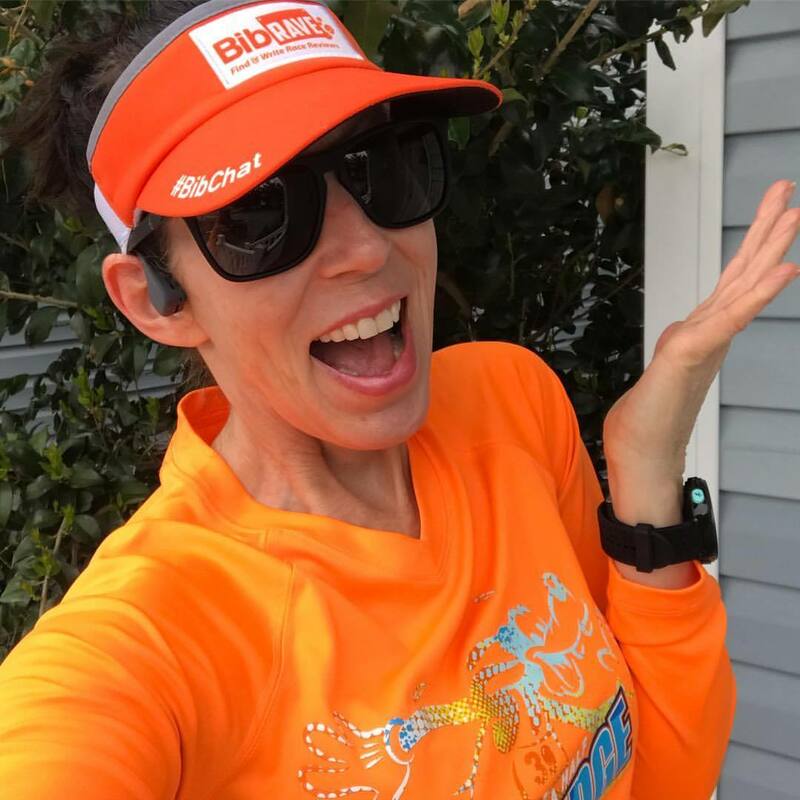 And don’t forget to come on over to the Joyful Miles Running Club Facebook group for details about any meet ups plus more tips and advise from runDisney veterans! I’d love to see you there! Are you thinking of testing the Minnie Vans one day instead of direct Uber? I’m very curious how they would work out in this situation. We did take a Minnie van once during our PHM vacation. It was very nice and our driver was amazing! Plus there are other perks we learned, such as once a driver picks you up, they will stop at another resort or location to pick up someone else. Plus they will also stop at McDonald’s or the Speedway if you need to pick up some groceries. The van was super clean and comfortable and it was great checking it out, but I’ll stick with Ubers from now on since they’re cheaper. What are the dimensions for the manila folder you use to hold the bibs (in inches if possible)? I want to do the same but I don’t know the dimensions. Thanks in advance!!! 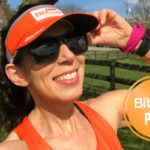 Next post: Why I love Running! Previous post: Podcast Episode 36: Perfect Princess!